The trumpet is one of the oldest types of instruments that are still being used, although it has changed a bit over the years! From classical music to jazz- the trumpet is an amazing instrument that is extremely versatile! But what are the best trumpet brands for beginners and professional level player on the market today? And which is the perfect trumpet for you? 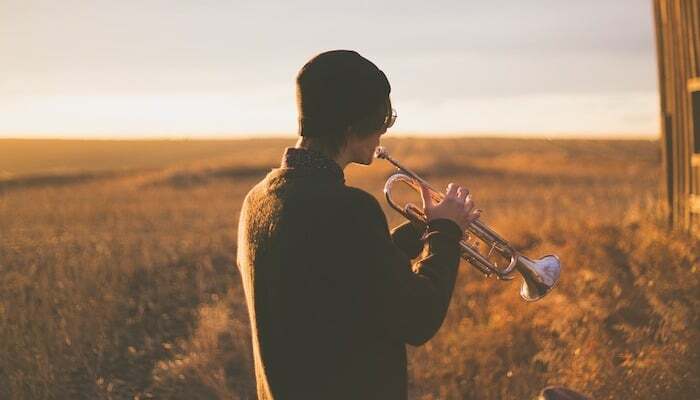 We decided to find ten of the best professional and student trumpet brands for beginners and intermediate players, but maybe even professional level trumpet players that are looking for a bargain! We have read through lots of reviews about different trumpets and we feel confident that we have found ten trumpets that are really good, and that we think that you should take a closer look at! We’ll also link to YouTube videos so that you can hear the trumpets for yourself. Choosing a quality instrument can and should take its time because it’s an important investment, so make sure that you have time to read through the reviews carefully. Why not pour yourself a cup of coffee and put on some nice trumpet music while you read this article? 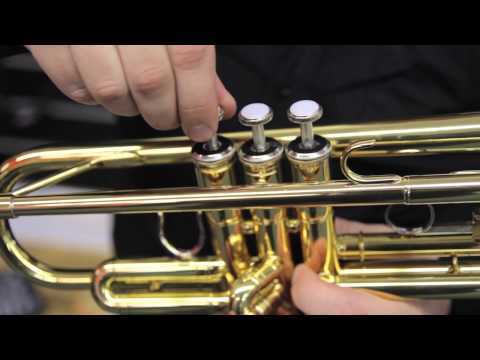 Have you ever heard Rachmaninoff’s ‘Vocalise’ performed on a trumpet? Look it up and enjoy! Where Did the Trumpet Originate? How Has the Trumpet Changed Over Time? How Many Types of Trumpet Are There? Ready to find your dream trumpet? We thought so! Just a quick tip before we start; why not make your own list as you go through these reviews? Write pros and cons for all the trumpets that you are interested in, that way it will be easier to choose! Looking for a Sax instead? Try our alto saxophone review here. 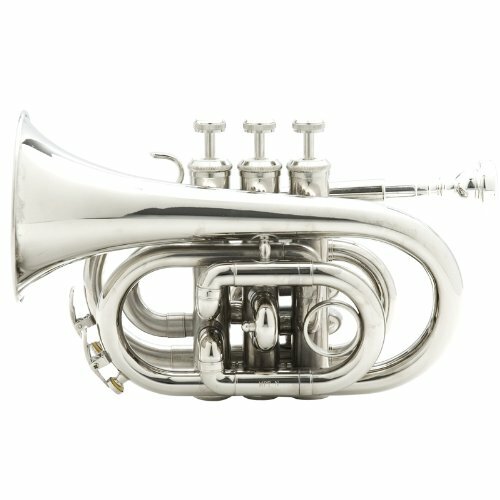 Are you looking for a Trumpet good enough for use in a band? If so, advice we have received from a Music Educator and professional Band Master is to strongly consider the Yamaha, Getzen and Bach Strad. 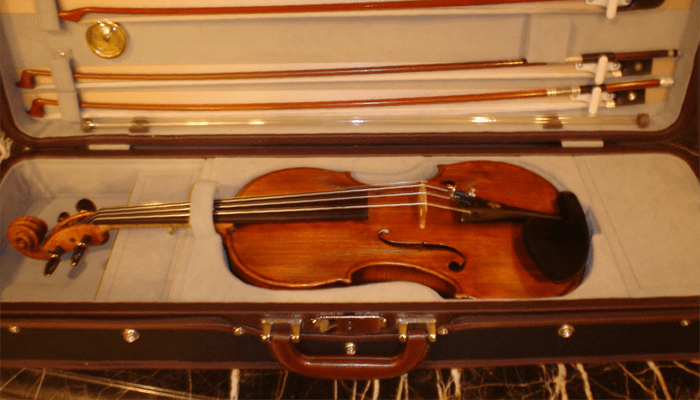 The Bach Stradivarius, Getzen 590S-S and Yamaha YTR-2330S cost a bit more upfront, but are recommended both for purity of sound and durability, for which they score considerably higher than brands like John Paul and Mendini. This is especially important for music students or band members who are likely to put the instrument to serious use. If you want to find a beautiful trumpet with a consistent, vibrant tone, Yamaha claims that this is the one you should get. It has an adjustable third valve trigger, which also means that it’s really comfortable to play and makes it easier for you to play with proper technique. It’s high-quality, and Yamaha is a good brand that seems to have success, no matter what kind of musical instrument they make! When you buy an instrument from Yamaha, you know what you get, and it’s great for trumpeters that don’t consider themselves risk takers. Here is a good review specifically made for parents in mind. If you’re a parent trying to find the right intermediate trumpet for your kid, or if you just want one for yourself, check this video out! Why We Liked It - This Yamaha YTR student trumpet is great for beginners willing to spend a little extra to avoid upgrading to a more expensive instrument any time soon, or intermediate players. 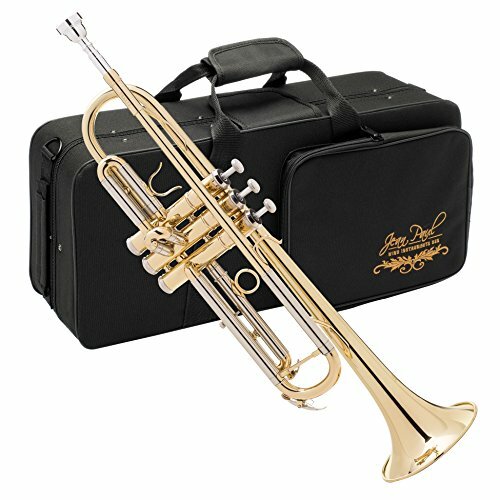 This Yamaha YTR intermediate trumpet sounds great, it looks great, and Yamaha is a good brand. What else could we ask for? The price of the Yamaha trumpet is ok as well, considering what you get for your money. There are trumpets, and then there are trumpets, if you know what we mean… If you start googling around for good trumpets you will soon come across Bach Stradivarius 180S37. This brand has extremely many satisfied customers that are absolutely in love with their trumpets. There are reviews to find online from trumpeters who have played this Bach Stradivarius 180S37 trumpet for decades. 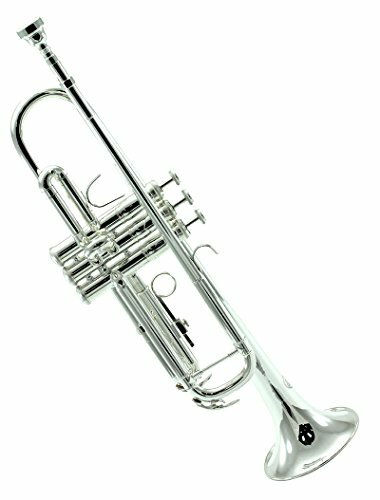 Bachs trumpets are perfect if you want to achieve a beautiful clear tone, and especially good for being able to reach those high notes properly. If you want to buy one of the best trumpets on the market that are still in a reasonable price-range, this Bach Stradivarius 180S37 is the one to go for! Don’t just take our word for it- go on to this video so that you can hear it for yourself! Notice the clarity of the tone and how effortlessly the guy plays, surely thanks to a really good instrument (and perhaps some new skill levels!). 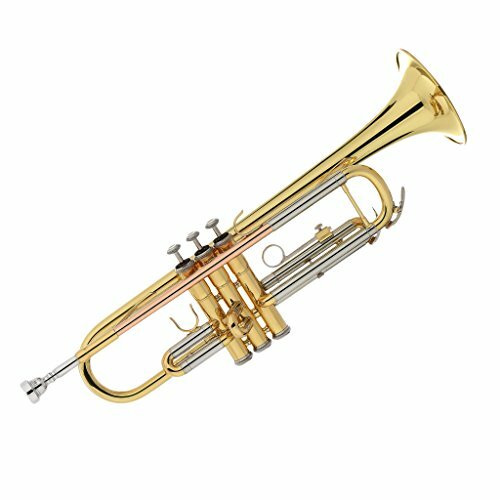 This Stradivarius Series Bb trumpet is great for all genres. 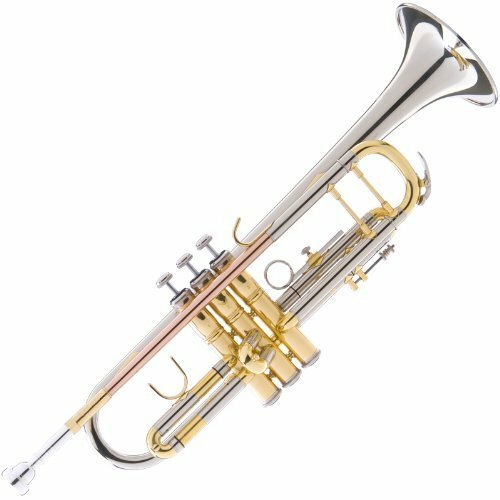 Why We Liked It - This Stradivarius Series Bb trumpet is perfect for advanced trumpeters who are buying a trumpet to last them indefinitely. This is not a trumpet that you’ll eventually have to upgrade from, but one that you will love to play for decades to come. Sure, it does cost a bit more than some others, but remember that you get what you pay for. An instrument is most often an investment and an item that you are going to keep for many years, so it makes sense to get the best one you can afford! If you read through this list to find the best trumpet out there, then you’ve found it! The quality of this Professional Series Bb trumpet is amazing and it sounds wonderful. Time to move on to number five on our list. Who is this trumpet for? We’d like to think of our instruments as our close friends. Are you a student trumpet player or even an professional player looking for your next best friend? Have you met Getzen 590S-S? Let me introduce him to you! The first thing that will strike you about him is how good-looking he is. His silvery looks make everybody stop in their tracks to take an extra look. But the best thing about him is the music you can make with him. Jazz? Sounds amazingly chill. Classical music? Sounds as clear as if the sun was shining upon snowy hills. There is just something about this trumpet, it’s extremely versatile and a really good instrument! 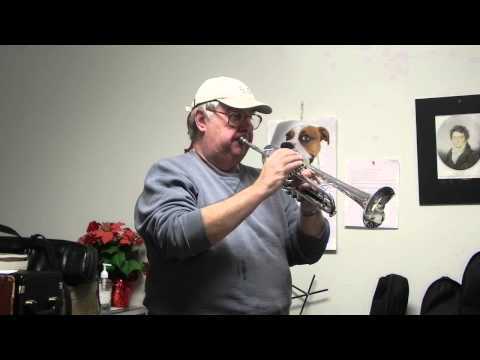 Here is a demo so that you can hear what this trumpet is all about! Why We Liked It - Sure, it might sound cheesy to think of an instrument as one’s best friend, but most musicians will know what we’re talking about! This trumpet from Getzen has the potential to be one of those loyal friends that never leave your side and chances are you will keep this instrument for the rest of your life! Perhaps you are looking for a bargain? Are you a beginner, or are you buying a student trumpet for your kid to learn on? Then Mendini by Cecilio MTT-L might be the instrument you’re looking for! It got an affordable price, looks nice and is surprisingly good. Even though this is a beginner trumpet, we read one review saying that one lady bought one for her husband, who’s an experienced trumpeter who has tried many different trumpets. He really likes it and started using it for concerts. 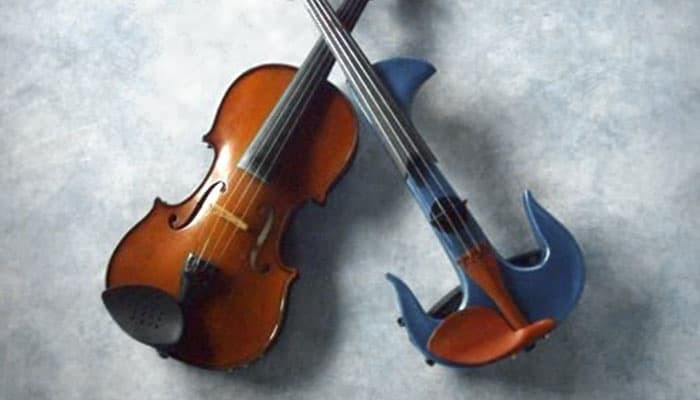 This is quite unusual, because most advanced musicians will not think much of beginner-level instruments, simply because they are most often not that good. So the fact that an advanced trumpet player recommends it, and even uses it himself is actually a really good sign. The Cecilio trumpet comes in quite a few different colors, choose between black, blue, purple, gold, red, silver and sky blue. This is especially fun for kids who play, that might be encouraged to practice if they have a trumpet in a fun color. You will also get a case to keep and carry it in, valve oil, a polishing cloth and a pair of white gloves and the trumpet is protected by a 1-year warranty against manufacturer’s defects. If you want to know more about this great bargain, we suggest that you watch this YouTube video that will teach you more! Why We Liked It - This Cecilio trumpet is a true bargain and any beginner in need of a trumpet should consider it! It’s fun that there are so many colors to choose from, but the trumpet is not just pretty, it’s more than playable as well! We like that there is a 1-year warranty, because sometimes when things are cheap, we get a bit worried that something might break, but that’s all taken care of as long as you treat the Cecilio trumpet well, so there is no reason to worry! Let’s move on to number 4 on our list! 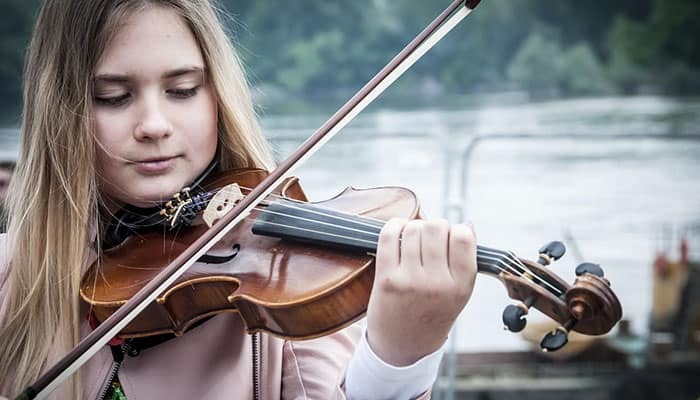 Jean Paul prides themselves on making professional instruments that are good for student to professional players and affordable price tag so that anybody can afford to play an instrument. Does this mean that they’re cheap and bad? No! 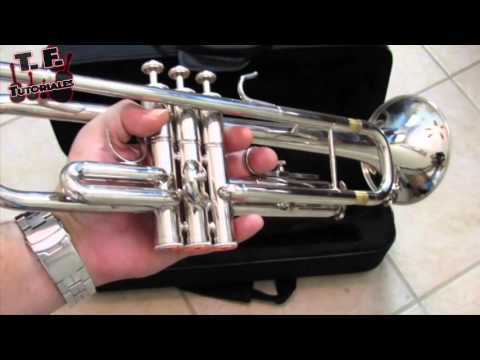 The TR-330 is everything a beginner needs from his trumpet, and the tone is nice and warm. It’s easy to play and it looks beautiful with a nice gold lacquer finish. Everything a beginner needs to get started is included. You get a nice carrying case, trumpet valve oil, a cleaning cloth, and gloves. If you need to buy a trumpet for a beginner but don’t know what to buy, go for this one! You won’t be disappointed! 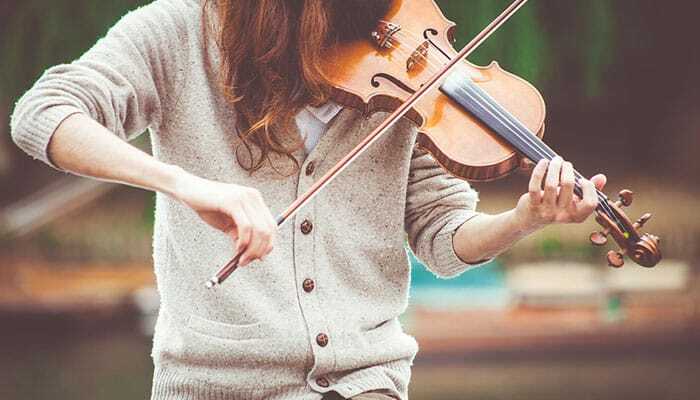 It’s good for all kinds of music, which is good, because a beginner will most often play many different genres before they find their specialty. Therefore it’s good to get a trumpet like this one, that is very versatile and works for almost anything. 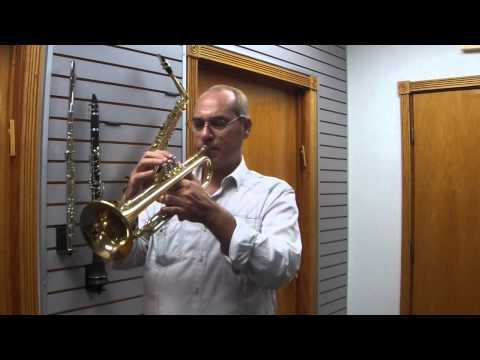 We found a great video review for this trumpet that a professional trumpeter has made. 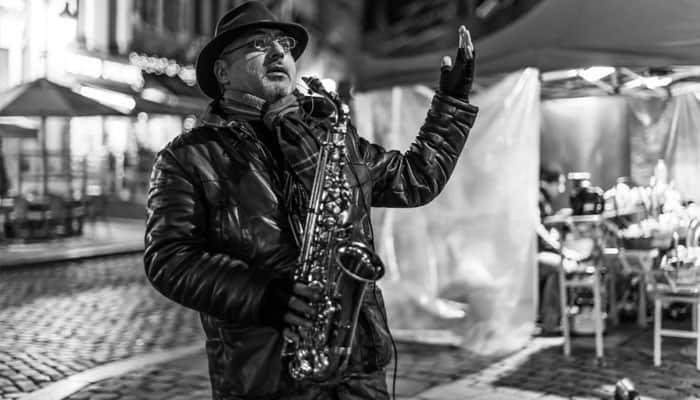 He demonstrates different genres, classical music, jazz and latin music, and the trumpet sounds great for all of them! Turn up your sound for this one, because the volume is unfortunately very low. Why We Liked It - Sometimes it feels like a gamble to buy beginner level instruments. It can either be ok or go horribly wrong. This trumpet takes all the worry away. It works like a charm and sounds great and you’ll be happy you bought it! Everything you need is included so that you can start trumpet playing straight away and you don’t need to order lots of extra stuff before you can get started, which is nice. 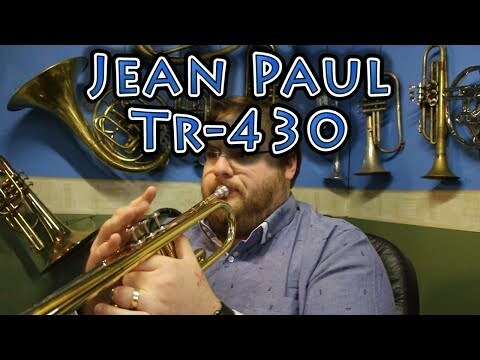 The time has come for us to take a look at our first trumpet, Jean Paul USA TR-430. We wanted to start off our list with a great trumpet that you just can’t go wrong with, and we’re thrilled that we found this one! The first thing we noticed when reading reviews was that people seem to be extremely satisfied with it. It has lots of 5-star reviews, and it has a full, rich tone. 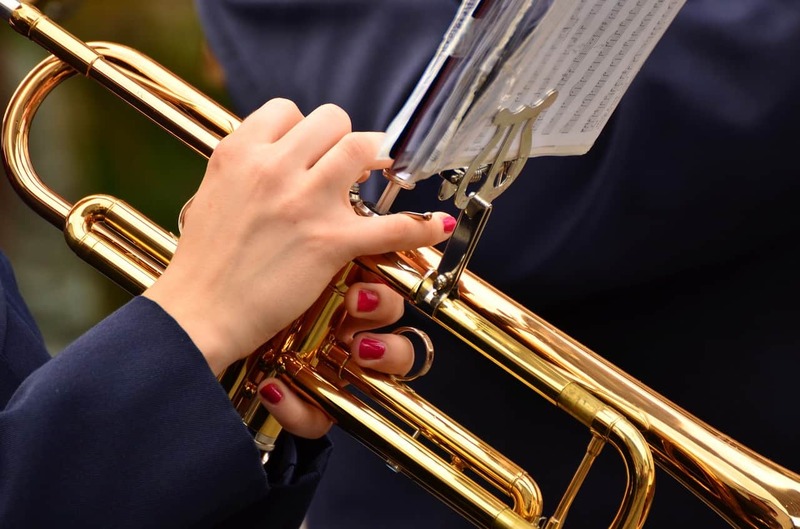 The advanced student trumpet has an adjustable third trigger which is great because it means that you can adjust it so that you can have a natural hand position, which is not only ergonomic but good for your technique. The trumpet is a Bb trumpet and has a rose brass lead pipe. It comes with a nice carrying case, a 7C mouthpiece, a polishing cloth and valve oil and gloves to wear so that you don’t smudge the trumpet when you’re cleaning it. It’s hard to go wrong with this trumpet, and we really like professional instruments like that! The most important thing when it comes to musical instruments is of course the sound! If you want to know more about this trumpet and hear it being played, then head over to YouTube and watch this video review. The guy has been using it for six months and still highly recommends it. This is good because it’s easy to like an instrument when it’s new, but then realize that it might not be as good as you thought it was when you’ve been using it for a while. 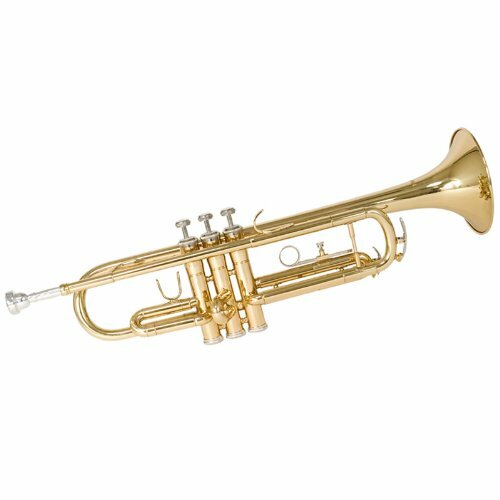 Why We Liked It - This advanced student trumpet is great for trumpeters who are moving on from being a beginner to learning more complicated repertoire and wants to upgrade a cheaper instrument to something proper. It will make it easier to play fast pieces and reach high notes and develop your technique. It sounds great and everything you need is included. The adjustable third trigger will enable you to develop your technique as you improve your skill levels. 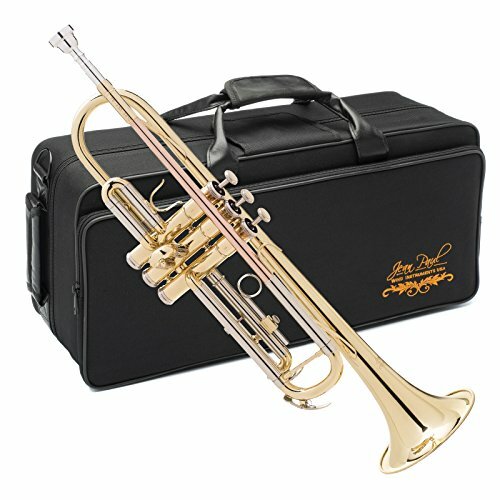 If you are a fan of gold, silver and rose brass, this is the trumpet for you! It looks great and is a good instrument for intermediate players. A chromatic tuner, a case, pocketbook, valve oil, polishing cloth, a trumpet stand and a pair of white gloves are included. The trumpet stand is foldable and stored inside the trumpet bell, which means that it’s easy to bring with you wherever you go. This trumpet is perfect when you don’t have much money to spend but want every cent to count. We would never have guessed that this trumpet is this cheap, it looks expensive and stylish. Why We Liked It - Musical instruments are most often timeless, but this trumpet is trendy! The different metals look great together and would suit any millennial perfectly! Another thing we like about this trumpet is that it comes with a 1-year manufacturer’s warranty. It’s affordable so you really have nothing to lose! If you want to try playing the trumpet but aren’t 100% sure if it’s the instrument for you, check out this trumpet from Kaizer. They offer a 45-day free trial. If you don’t like it, you can send it back and get a full refund! Also, they offer a lifetime warranty, which is amazing. A case, polishing cloth, trumpet valve oil and white gloves are included. 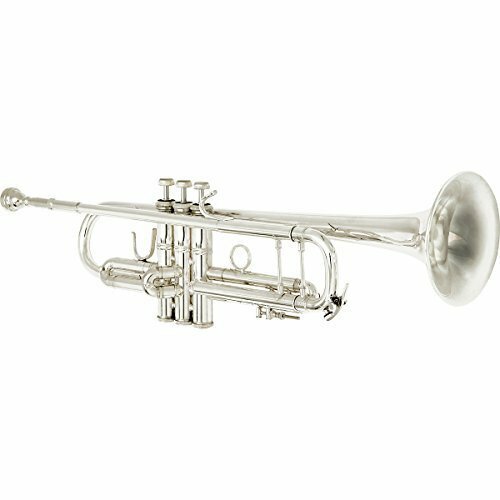 The quality trumpet is designed to be able to withstand harsh handling from keys throwing it about, and it seems to be very high-quality. They also offer the trumpet in four different colors, nickel, blue, lacquered brass and purple. Having a trumpet in a nice color is something that sometimes really can encourage children to practice more, and they will instantly become the most popular kid in the band! This quality trumpet is great for beginners, both adults, and children. It has a third valve slide ring which makes it easy and ergonomic to hold and helps with your technique. Why We Liked It - There is nothing that beats a lifetime warranty, and a 45-day free trial is just awesome. We really like the idea of trying the trumpet out properly before you commit to it. This quality trumpet is also great for children since it’s built to be extra durable so that it won’t break when kids handle it roughly. The fact that you can find these trumpets available in different colors is also something that appeals to children. Sometimes when people start playing an instrument, and especially children, they don’t really know how long they will actually keep it up. For this reason, they prefer to buy a cheap instrument. That way, it’s not a disaster if it ends up in the attic never to be used again until your grandchildren find it in fifty years or so. If this is the case with you, that you don’t want to spend too much on a trumpet, this one from Sky might be a good option. It’s cheap and, let’s face it, not particularly high-quality, but it’s at least something to get you started until you’ve decided if trumpet is for you. It comes in several different colors. What do you say about black, green, gold, nickel, silver, purple or red? A case is included, as well as valve oil, a polishing cloth, and white gloves. Sky offers a 1-year manufacturer’s warranty, so there is no risk involved, really. Why We Liked It - Even though this trumpet is far from the best on the market, we think it’s great that there are ok options for trumpeters who don’t want to spend too much money. Perhaps you play another instrument but would like to play some trumpet as well, or maybe your wallet would be mad at you if you bought an expensive trumpet right now. No matter your reason for wanting to buy a cheap trumpet, this one is a good choice. If you’re often on the go and would love to be able to take your trumpet with you to be able to practice you should buy a pocket trumpet! Take this one from Mendini, for example. It’s about half as long as a full-sized trumpet and even though it doesn’t actually fit in your pocket, at least it will fit in most bags! A case is included, as well as a chromatic tuner, a pocketbook, valve oil, a polishing cloth, white gloves and a stand. It comes with a 1-year manufacturer’s warranty. There are a few different colors to choose from, black, blue, gold, green, nickel, and red. We love the idea of being able to bring our instrument with us where ever we go. 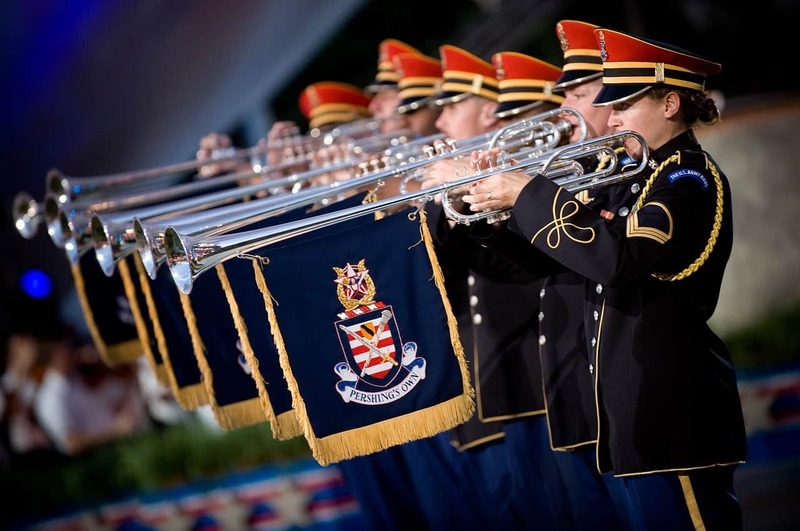 It’s good to be aware that the tone isn’t as great as that of a normal-sized trumpet, you will only want to use this trumpet for practicing, not for concerts, and you should have a normal trumpet as well. Curious about this cool little trumpet? Check out this video to find out just how cute it really is! Why We Liked It - Every trumpeter should own one of these! The handy size makes it easy to bring with you and you’ll be able to practice every single day, even when you’re on vacation. We like the fun colors, and also the fact that so many things are included, even though you might already have a few of them for your regular trumpet. The 1-year warranty doesn’t hurt either! After writing these reviews, we just wish we could buy all of these trumpets! 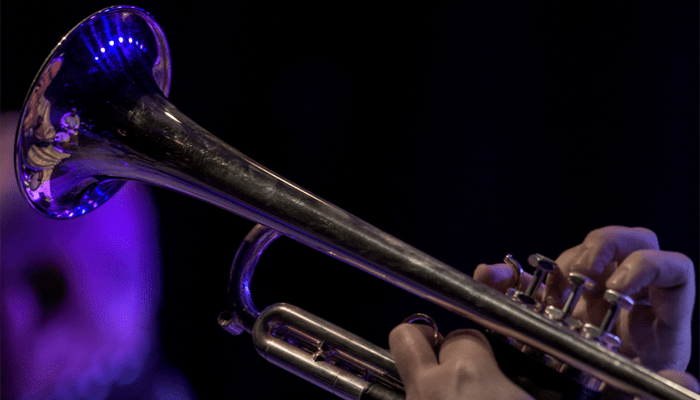 We can all agree that there is a perfect trumpet out there for every trumpeter, and chances are that the right trumpet for you is on this list! We really tried to cover trumpets for all kinds of trumpeters, from student to professional trumpet players. We’d like to finish off with a piece of advice. Before you buy a trumpet, think through what you need from it. How long and how often do you think you will play it? And how important is it for you to be able to improve your playing, without having to upgrade to a better trumpet after a few years? Thinking about these questions will help you decide how much you should invest. Generally speaking, you get what you pay for, and even if bargains can be good sometimes, this is not always the case. 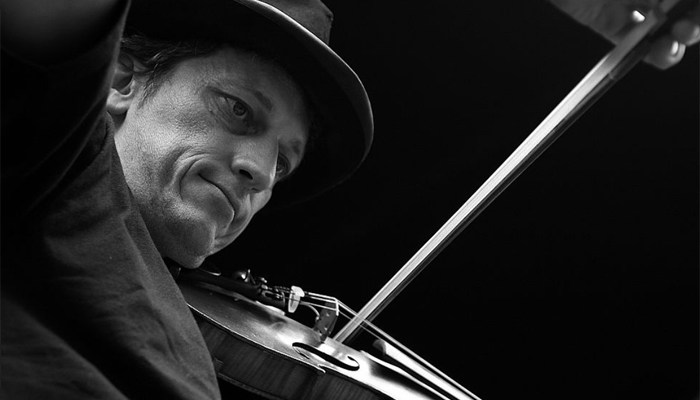 We would advise you to spend as much as you can afford, ensuring you that you get the best instrument you can find. Few instruments have such an interesting history as the trumpet does and it has been around for thousands of years in some form or another. From the beginning, it was used in battle or while hunting, simply for signaling, but in the late 14th or early 15th century, it began to be used as a musical instrument used for art music. Bronze and silver trumpets were discovered in Tutankhamun’s grave and it was not just in Egypt that they had trumpets around 1500 BC, but also in China and Scandinavia. The Bible also mentions trumpets and they were used in Solomon’s temple and in the battle of Jericho. At first, there were only natural trumpets, that were made of a single coiled tube. There were no valves and the trumpeter could only use a single overtone series. It was possible to change the key by changing crooks of the trumpet. During the baroque era, trumpets were incredibly popular and a lot of music was composed for the trumpet. In 1818 the history of the trumpet would change when the box valve was invented. This was the start of the trumpet that we know today. It did take some time for this novelty to become completely established, and many held on to the old type of trumpets for quite a long time, but at the beginning of the 20th century everybody had realized how great the trumpet is in its new shape, and it became extremely important in jazz music and other genres. The most common type of trumpet is the Bb trumpet, which is used in most genres. Next in line is the C trumpet, which is very similar to the Bb trumpet. They are used if the Bb trumpet is unsuitable for some repertoire, which might be the case when it comes to certain finger combinations or other technical aspects. The C trumpet also has a slightly brighter tone. There are also Eb trumpets and D trumpets that are great if you are looking for an even brighter tone since they are smaller. There are also E, F, and G trumpets, but they are quite unusual. There is also a piccolo trumpet, which is small and very high and mostly used in orchestras. 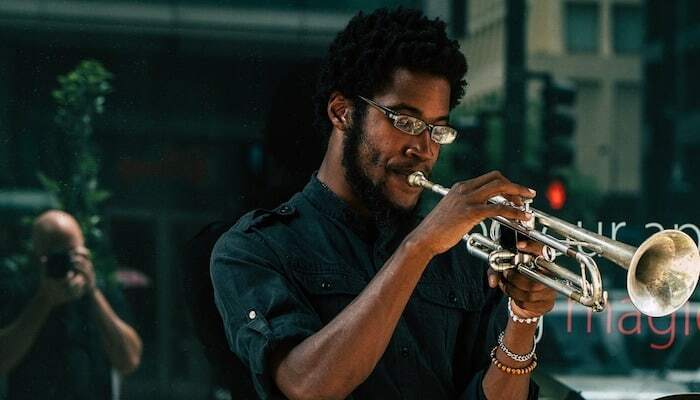 Speaking of small trumpets, you can also get pocket trumpets, designed to be easy to bring with you when you travel so that you can practice anywhere. It’s important to take good care of your trumpet. See this progressive trumpet playing guide for help. 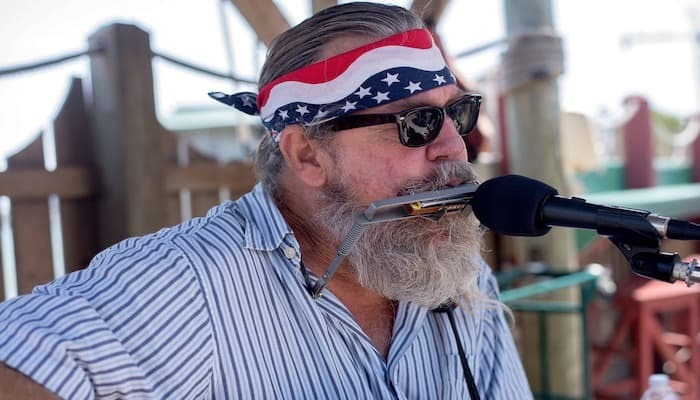 At first, only singing was allowed in the Catholic church, and slide trumpets were the very first musical instruments that were allowed.